EverEdge galvanized steel edging is all-in-one. Each 39" long section locks permanently into the next. No stakes or separate parts to come loose. Powder coated in four colors to match your landscaping décor (brown, black, slate, and Cor-Ten*). It's made in England and is the edging choice for their manicured lawns. Each package contains five 39" pieces for a total of 16.25 feet and is available in three different heights: 3", 4", and 5" (Cor-Ten is only available in 4" and 5"). Regardless of the height chosen, the attached spikes are approximately 3" long. Since it is necessary to allow for a 6" overlap, simply divide the total number of feet needed by 15.42 to determine the number of packages required (round up if necessary). Each piece is approximately 1.6mm thick and can be bent to form corners, curves, or circles. 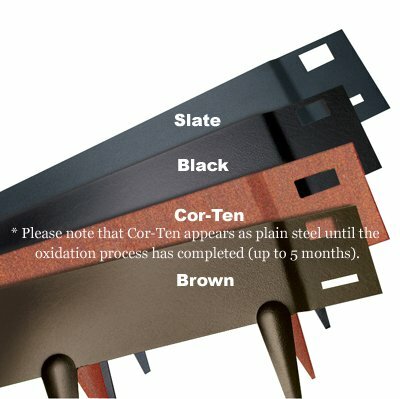 *Cor-Ten is a product that is designed to weather naturally. Initially it appears as though it is just plain galvanized steel but, over time, a thin layer of rust forms a protective layer over the edging strip and does not break down like normal steel.